This is one of the few original recipes I think I’ve ever posted to I Eat Veg! Of course, it happened by chance, as most of my creations happen on the fly. When I first moved to Metro Detroit, I wasn’t very familiar with the restaurants in the area and had a tough time finding a good samosa. I lived in Lansing for close to a decade and, during that time, LOVED the samosas at Aladdin’s in Frandor. Then I moved on to Wisconsin, Chicago and eventually Detroit, going years without having one at all, I think. I got a hankering for them one day and decided to make my own, using the following recipe but trying to stuff it into cannister rolls (like Pillsbury biscuits, etc.) and they were just OK. A few weeks later some friends in town from L.A. were coming over for dinner and, unexpectedly, they were in the neighborhood and ready to come over just seconds after we returned from a movie — totally unprepared to feed people! As D, S and A enjoyed a cocktail, I was rushing around trying to get dinner ready and the filling was spilling out of the little biscuit pockets I made and I decided — forget it! I have pie crusts in the refrigerator (don’t tell my mom I now make a habit out of using store-bought pie crust — but not for pies!). SO, I decided to make a giant samosa, so-to-speak. 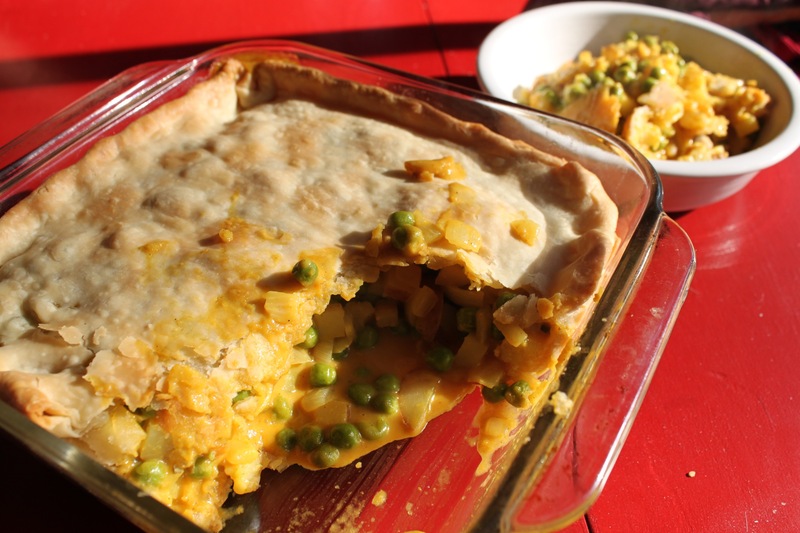 I did a post on what I then dubbed Indian Pot Pie a while back, but thought it deserved a re-post since it’s been a long time. This is definitely the new comfort food. And better yet, there is no measuring and only a handful of ingredients. It’s pretty hard to mess it up! This recipe easily makes 4-6 entree servings and costs less than $10 to make! 1. Dice potatoes. I usually end up using roughly six potatoes — some small, some medium redskins — and cut them pretty small so they will cook faster. 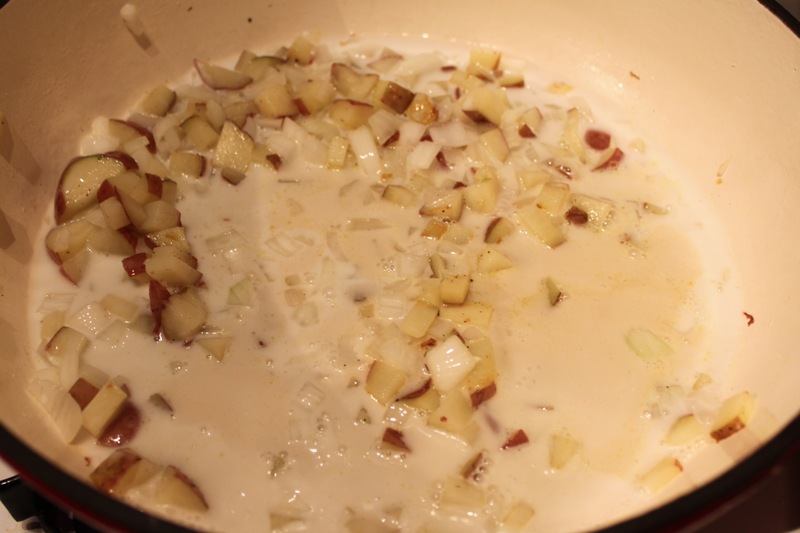 Heat oil in a pan and cook with onions until the potatoes are sticking so much it’s annoying (it’s science). 2. Shake can of coconut milk well and add, using it to deglaze the pan (i.e. scrape up the bits of potato that stuck to the bottom). 3. 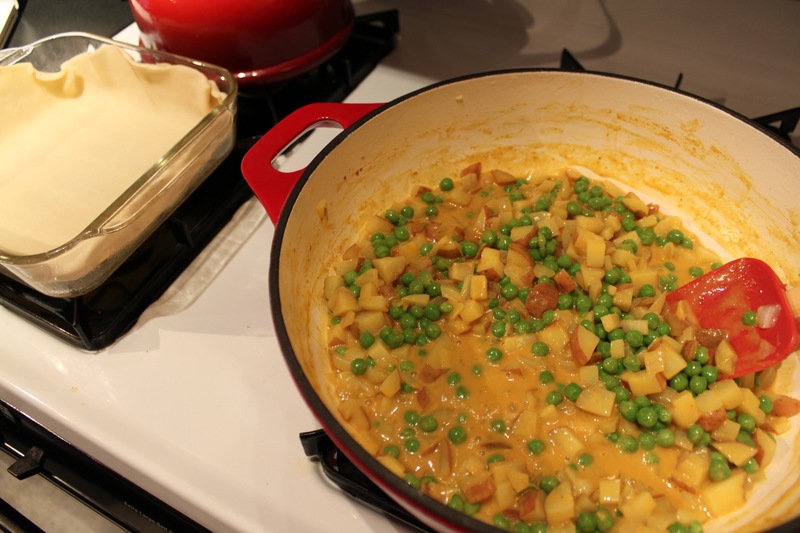 Add curry paste and whisk or stir in until it is well blended in the coconut milk. 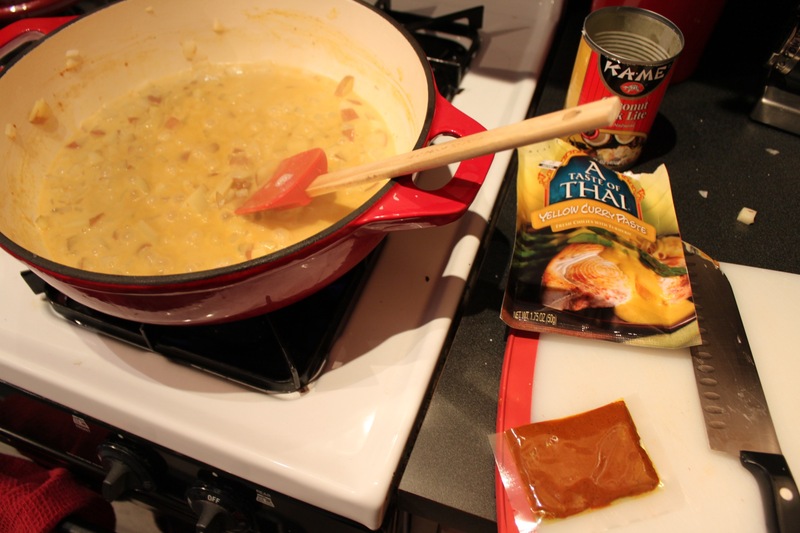 If you are using the packet of Taste of Thai curry paste, remove plastic packet and smooth out, laying flat. Cut in half with a knife or kitchen scissors, so you get exactly half. You can always add more or less, but after trying a few different amounts, I’ve found this to be a good, flavorful amount. If you don’t have paste and just have yellow curry powder, you can wing it. That’s what we did when we tried to create this dish for our friend in Nicaragua, but didn’t have all of the ingredients. 4. Cook this over medium heat for a while (maybe 5-10 minutes) until it cooks down to a consistency that isn’t watery and has just a nice, thick sauce — and not a ton of it! If you don’t cook it down to where it’s thick, the end result can be kind of runny. 5. Add frozen peas after it cooks down for a bit. Add as much as you want — I imagine I end up putting in 1-2 cups. I just play it by ear, adding the frozen peas until the ratio looks about right (again, it’s science). 6. 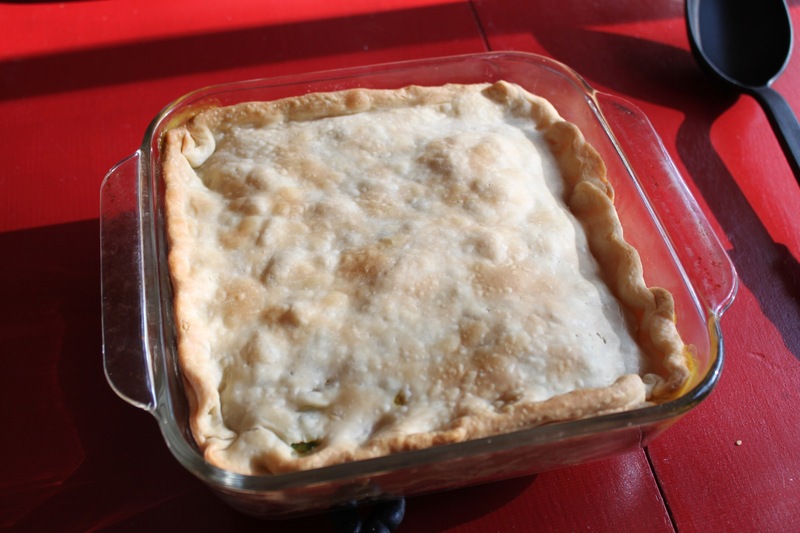 Take 8×8 glass dish and place one crust in it, so it sits pretty evenly. Though I don’t think it’s necessary, I sometimes spray the dish first with non-stick spray to be safe. Spoon or pour filling into pie crust. Somehow, miraculously, it almost always ends up filling the dish up perfectly. 7. Place the second crust on top and squish the two together, sealing it as best you can. Somehow I always poke a hole in the top crust somewhere, but it never matters. 8. Bake according to the directions on the pie crust box — the inside already is cooked (or should be at this point) so you really just want to bake the crust. SO, bake for whatever time is on the crust box (20 minutes?) or until nicely browned. Allow to cool for a while because it will be molten inside. Spoon out and enjoy! I’m sure this would be good with some kind of chutney too, but I haven’t tried since I failed at making chutney with this dish a couple of years ago (the aforementioned original post of this recipe). This recipe is super easy and fast and just plain delicious! I always forget how much I love it until I have it in front of me. I imagine this is one of those recipes you could easily freeze and thaw later too! Entry filed under: Main Dish, Recipes, Uncategorized. Tags: baked, cheap, comfort food, curry, curry paste, samosa, thai.